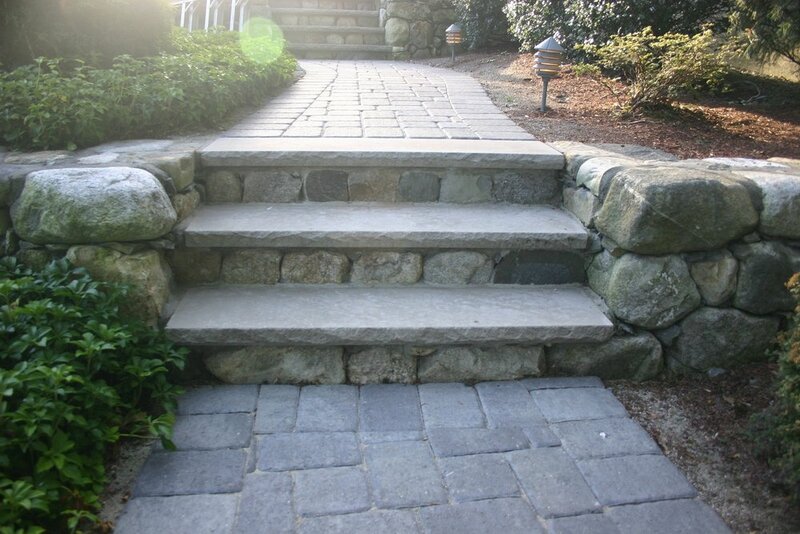 Top Paving Contractors in Lincoln MA for Steps & Entries | Premier Pavers & Hardscape Co. The right steps and landing define a welcoming atmosphere at your front entry or patio area. Stairs built into retaining walls create terraced areas that help you maximize use of your land with multiple functional areas for relaxing or entertaining, even on sloped lots. Join several distinct spaces with paver steps, for a multi-level dream landscape. Combine materials for a unique and personalized look. Add built-in lighting for drama and nighttime safety. Introduce planters for a pop of color. Your choice of paver materials, styles, colors, and shapes should complement the home and fit beautifully into the landscape. Steps made using concrete blocks, fieldstone, bluestone, limestone, or granite are both practical and aesthetically beautiful. Enhance your home’s curb appeal and add value to your property with well-designed and professionally installed steps and entries. From the very start to the very finish (tonight) we have been blown-away by the high skill level and the overall professionalism of this company.